A little bit of the old, and a little bit of the new as well. Nic shows how timeless Li'l Davis product is, with items from the Vintage wood, Jenny Bowlin, and Crillion ranges as well as various ribbon. As Caz’s daughter Darcy seemingly rockets towards being a teenager, Caz has noticed many changes in both her appearance and manner. This beautiful photo was taken on an outing at Luna Park the day after Darcy turned 12. Caz used the Heidi Swapp Days of the week Journaling Spots to list some of the changes that she has come across during this past year. The fabulous flourishes, flocking, drama and colours of the Li'l Davis Vanderbilt Collection worked perfectly with this oversized photo of Suz’s son Alex atop his ‘pirate ship’. The gorgeous velvet ribbon woven through the patterned paper echoes the ‘rigging’ in the photograph. Li'l Davis Glitter Garden spotted and floral patterned papers form the basis of this layout by Suz. The colours are bright and funky but still allow the eye to be drawn to the photo. We R Memory Keepers Dipsticks, a bit of Heidi Swapp bling and some Queen & Co keep this layout light and colourful but still cohesive. Suzy Plantamura is in love with the Love Affair line by Li'l Davis, and we are in love with Suzy’s layout. From the funky mix of papers and embellishments, to her unique journaling idea, to the sweet photo of little Chloe. It’s a layout that just jumps out at you. These two stunning layouts are shared with the permission of the very talented Renee Camacho. They showcase two of Li'l Davis' newest paper ranges - Spring Fling collection (so new it's not in the country yet but look out for it soon! ), which features printed acid free acetate, metal flowers, bo plates, stickers, and stunning pastel papers. The second layout is from the Endless Summer range - beautiful rich reds and browns and blues which would work as well for deep winter as it would summer. No longer do we have to hide our adhesive tabs when we are sticking down transparencies, Mary Grace Abuzman has made them the new fashion! This fabulous layout has it all. A beautiful photo, innovative design and fabulous textures from combining a large number of products. Thanks for allowing us to share, Mary Grace. We thank Kori Babb who has allowed us to share a couple of her layouts. 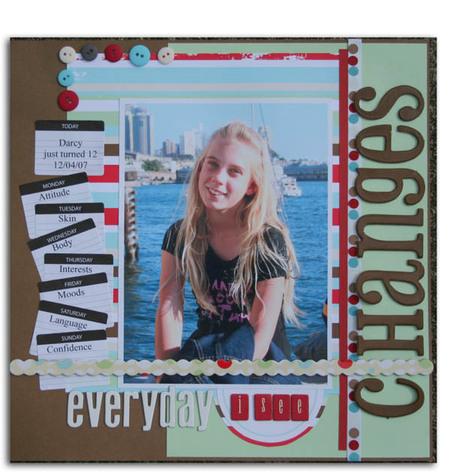 Here she has used the Rockstar range of Li'l Davis products to create this layout. Striking photos, along with a clever arrangement of Li'l Davis embellishments, finished off with some clever machine sewing all makes for a stunning Rockstar layout. ‘Cherish’ also by Kori Babb caught our eye, as the simple colour scheme of the Li’l Davis Glitter Garden accents lets the black and white photos remain the focus of the page, while adding sweet girly elements. Embrace by Vanessa Reyes. The Crillion range of Li'l Davis products was a hit as soon as it was released. Here we see the Crillion Motif paper paired with Crillion Chipboard rounds and finished with Li'l Davis flower and alphas. It's a fairly simple layout that is visually stunning, and this is exactly what got our attention in the first instance. And thanks again to Vanessa Reyes for letting us share a second layout. "Dream Big" shows wonderfully how the Tinseltown range of Lil Davis products makes it so easy to create a fabulous layout. Even the blue journaling is Lil Davis. We love how it has all come together.